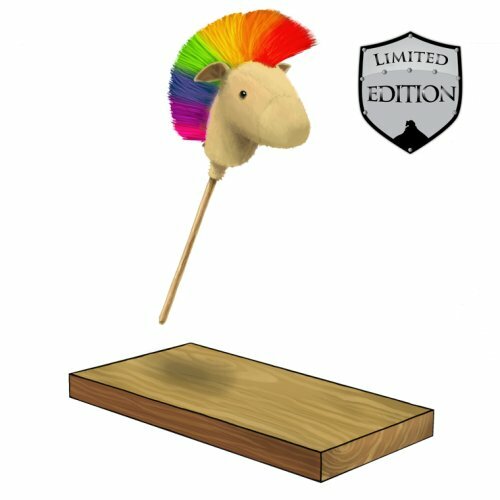 The HitGrab Rainbow Rockin' Horse is a Limited Edition Physical type weapon that can be upgraded from the HitGrab Horsey. Unable to pull back its lips to let out a rockin' NAAYY this Horsey compensates by having the loudest hairstyle possible! These hobby horses have often been threatened with exile from the Kingdom after keeping the King up all night to the sound of closet moshing. Rock on... HUNT ON! The HitGrab Rainbow Rockin' Horse is a Limited Edition weapon and can no longer be acquired by Hunters. It was not sold by any Trapsmith. It can only be crafted given the proper ingredients. HitGrab Horsey – Source of Hobby Horse Parts. HitGrab Rockin' Horse – Non-smashable version purchasable from Ronza in October 2009. Smashing this weapon with the Hunter's Hammer yields the Hobby Horse Parts and Rainbow Mohawk Wig of Awesomeness. 20th October 2009: The HitGrab Rainbow Rockin' Horse was first introduced with the arrival of Ronza's Traveling Shoppe.